After a pretty hectic few months, a break away for a few days was just the thing. I had never visited Cornwall and was keen to check out the first county of England first hand. We opted for a break that would be fairly relaxing, but would also allow us to stretch our legs a little and hopefully tone up, in preparation for more challenging walks in the future. We booked into an excellent B&B called the Granary, situated in a little coastal village called Boswinger, about 10 miles south of St. Austell. The Granary is a converted barn, with wonderful views of the Cornish coast. The friendly staff also do a wonderful breakfast, including free-range eggs from their own hens and cater for vegetarian and non-vegetarian alike. Saturday morning started with a visit to the nearby seaside town of Mevagissey, for a little shopping and to enjoy a traditional Cornish cream tea, in a comfortable little harbourside cafe. There were also some of the largest Cornish pasties I've ever seen. We then visited the nearby Lost Gardens of Heligan. During the heyday of the Heligan estate, some 150 years ago, the gardens not only contained a large and fascinating variety of unique garden plants and environments, they also were extremely productive. The succession of squires who managed the Heligan estate as an ongoing family concern, collected plants and seeds from all over the world, and created a fascinating patchwork of landscaped garden themes, ranging from the more austere Roman and Greek-style garden environments, through to the more wild environments of the sub-tropics and the mystical grottos of Celtic and Arthurian legend. The decline of the estate reflected the major political and socio-economic changes of the 20th century; as international travel became easier and more sophisticated refrigeration and storage techniques were developed, self-sufficient estates like Heligan quickly fell out of vogue. But thanks to a large team of dedicated staff and the support of the Eden Project, these remarkable gardens are well on their way to being restored to their former glory. You can find more information and photographs of this beautiful garden estate on their web site, which also includes a magic lantern slide show, special events and visitor information. No visit to Cornwall would be complete without a visit to the Eden Project. Set within the site of an abandonned clay quarry, this remarkable "Garden for the 21st Century" is a fascinating place where science, technology and nature are combined to bring us the story of Man's dependence on plants and offers a wealth of practical ideas and methodologies to promote a more sustainable future. 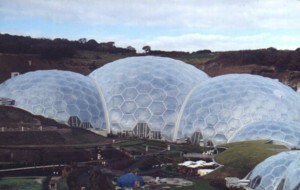 The first part of the Eden story, is the building of the facility itself. It represents a marvel of modern engineering from it's foundations upwards. Firstly, the sides of the quarry site had to be shored up and made safe. This required hundreds of giant supporting "bolts" to be driven into parts of the quarry face, to spread the weight distribution evenly. 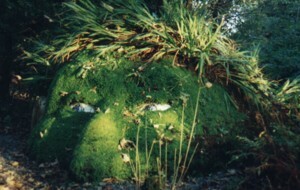 The entire face was then sprayed with a mixture containing fixatives and a fast-growing and hardy grass seed, which quickly took hold and made the face entirely stable. In December, 1998 the project site fell victim to some of the heaviest rains on record and work had to be suspended until the drainage issues could be resolved. But by March, 1999 work was back in full swing with hundreds of staff and volunteers working around the clock to bring the project to life. In March, 2001 the facility opened to the general public and the millionth visitor passed through it's gates in June of the same year! You can view further information about the Big Build on the Eden Project's own website. Well worth a visit. 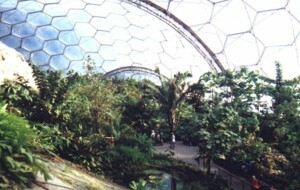 The biomes are presently the largest in the world and are modelled on the same principle as the eye of an insect, combining strength with versatility. Each of the pillow-like hexagonal shaped panels is made of a transparent foil called ETFE (ethyl tetra fluoro ethylene) which is a triple-glazed material, anti-static and very transparent to UV light. 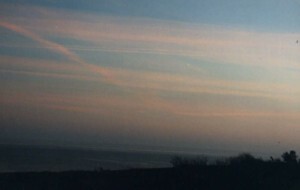 The biome environments are fully climate controlled, much of which is handled automatically, by sophisticated real-time computer monitoring. But it's not all science and engineering; the artistic side of human nature is also very prevalent here. There are no large notice boards to read or many virtual reality-style toys to distract you. Instead the entire facility is an experience that touches our senses of sight, smell and hearing. The works of a variety of artists are dotted around the biomes and they all enhance the overall experience greatly. I particularly liked the bronze statues of figures from Greek mythology in the Mediterranean zone. All in all, the Eden Project is much more than just an enjoyable day out; it offers us a fascinating insight into what we can accomplish when we are prepared to look at the long-term view of ongoing sustainability, instead of short term greed and exploitation. It is also a shining example of how a partnership of science, technology, engineering and the arts can combine with the highest aspirations of the human spirit and it's desire to reach for the stars, to bring us the answers to the many questions that currently cloud our future as a species and a civilisation. "Many people said what we were doing was impossible ... we say: Demand the impossible! " - Tim Smit. If you get a chance to visit this remarkable facility ... don't miss it. On the way home, we decided to drive across Dartmoor which, on a bright sunny day is a spectacular place, with views for miles over the lowlands and peat district. Most famous for it's creepy winter atmosphere, immortalised in films such as "An American Werewolf in London", the moors are nonetheless incredibly beautiful in the summer and autumn and provide an ideal environment for the many walkers and hikers who visit every year. 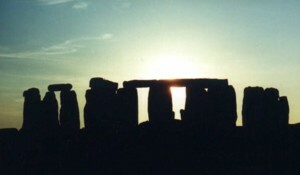 Just a few miles from our home is the most famous monument in the British Isles - Stonehenge. Cornwall is definitely worth a visit if you're looking to get away from the rat race for either a few days or a week or two. The people are friendly and helpful, the scenery is breath-taking and the food is fantastic.